Bring subtle interest to your smart looks. 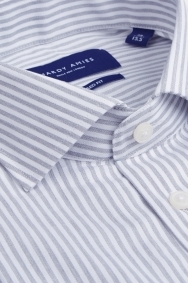 With its grey and white stripes, this shirt will liven up your outfit without taking over. The melange finish adds texture for an on-trend look too. Featuring a cutaway collar, it’s a sharp item, while the tailored fit cinches slightly at the waist for a flattering outline. 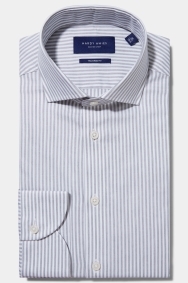 Machine washable and made from a soft 100% cotton, it will become a firm favourite. Team with any suit – the neutral tones make it a versatile shirt. You’ll need a tie to fill the cutaway collar, so choose one that brings out the colour of your suit.